Dow Jones ends +26 points to 11559, another fresh 2-year high at 11559 amid optimism on 2011 economic outlook after a strong November existing home sales and a resilient US 3Q2010 GDP of 2.6% (better than earlier Government estimates of 2.5%), albeit slightly below consensus’ 2.9%. Sentiment was also boosted by financial companies as investor sentiment towards the sector continued to improve following recent deal activity including Toronto-Dominion Bank's Tuesday announcement of a US$6.3bn purchase of the former auto-lending arm of Chrysler and Bank of Montreal's agreement last week to buy a big Midwestern bank in a US$4.1bn share swap. Oil & gas related stocks were also in demand as crude oil surged to 2-year high at US$90/barrel given that the Energy Department’s weekly inventory report showed a bullish 5.3 million-barrel decline in available U.S. crude supplies. On Wall Street, in view of the expanding Bollinger bands and rising RSI, the Dow could head higher for the remaining trading sessions in 2010, offsetting the overbought slow stochastics indicators. Immediate resistance level is 11668 (upper Bollinger band) whilst support levels are 11357 (middle Bollinger band) and 11248 (50-d SMA). 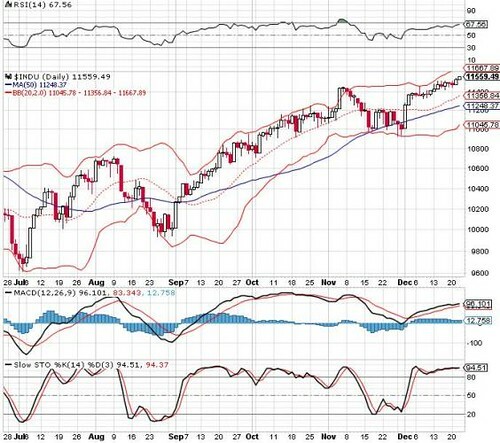 Daily DJIA shows expanding bollinger bands bode well for more upside.